Spread the word! Promote Odyssey to your customers or clients. Use these resources to share your involvement with Odyssey and bring more attendees – and attention! – to the event. Add the “I’m Attending!” email flair to your outgoing email signatures. Grab some of the “What is Odyssey” text and share it in your company newsletters. 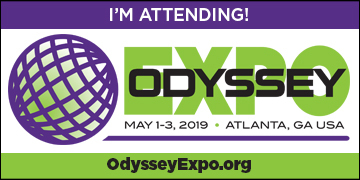 Check out the Exhibitor Marketing Information Sheet for more ideas and resources that can be used to promote Odyssey Expo 2019 and your company’s involvement. Tips, strategies and examples for marketing Odyssey to your customers and prospects. This graphic can be personalized with your booth number. Contact info@OdysseyExpo.org for more details. Click here to see press releases to date.